Fish eggs, such as the large salmon roe you might be served at a sushi restaurant or the tiny black pearls of caviar often served on a blini with creme fraiche, are off the menu for many people who haven't acquired the taste. But daring palates that savor the salty flavor and unique texture of fish eggs are also getting a potent boost of nutrients, including vitamin B-12 and omega-3 fatty acids. However, like all good things, fish eggs should be eaten in moderation because they are high in sodium and cholesterol. Fish eggs can be highly nutritious, but avoid eating them too often. Here's the good: omega-3 fatty acids, B-12, and high protein content. Here's the bad: high cholesterol and sodium content. Fish eggs come in a variety of sizes, shapes and colors. 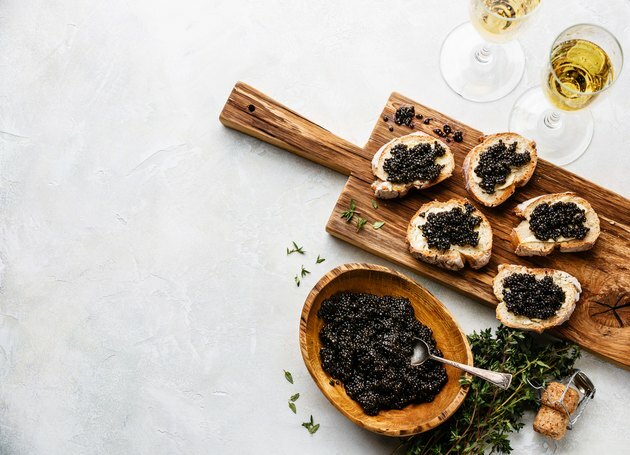 Caviar comes from sturgeon, a type of fish found around the world, but notably in the Caspian Sea and Ural River, where five of the six species living in those areas, including the beluga, are prized for their fish eggs. The large orange eggs you see at Japanese restaurants, called ikura, are also caviar, but they are more commonly referred to as salmon roe. Lumpfish and whitefish roe are other commonly consumed varieties of fish egg. A little over 1 gram of the total fat content is from saturated fat. Less than 0.2 gram of the total fat comes from saturated fat. Fish eggs are high in the omega-3 fatty acids eicosapentaenoic and docosahexaenoic acids, and they are also rich sources of vitamin B-12. Omega-3 fatty acids are crucial for proper brain function and heart health, and they help reduce inflammation in the body that can lead to chronic disease. Vitamin B-12 is another brain-boosting nutrient, and it also helps the body metabolize food into energy. One ounce of salmon roe contains 1,096 milligrams of total omega-3, with 438 milligrams of EPA and 514 milligrams of DHA. That's more than the 1 gram daily recommended for heart health by the American Heart Association. One ounce of whitefish caviar contains 15.8 micrograms of B-12, a whopping 263 percent of the daily value. Just like poultry eggs, fish eggs are also high in cholesterol. A 1-ounce serving of black caviar contains 165 milligrams of cholesterol. That's more than half of the daily limit of 300 milligrams recommended for healthy adults. A diet high in cholesterol increases your risk for heart disease. The sodium content of caviar is another drawback. Fish eggs are soaked in a salt solution during processing, which drives up the sodium content. Consuming too much sodium, more than the 2,300-milligram daily recommended limit, leads to increased risk of high blood pressure, stroke and heart disease. A 1-ounce serving of black caviar contains 420 milligrams of sodium. Whitefish caviar is a better choice if you are watching your sodium intake, as it has only 45 milligrams per ounce.